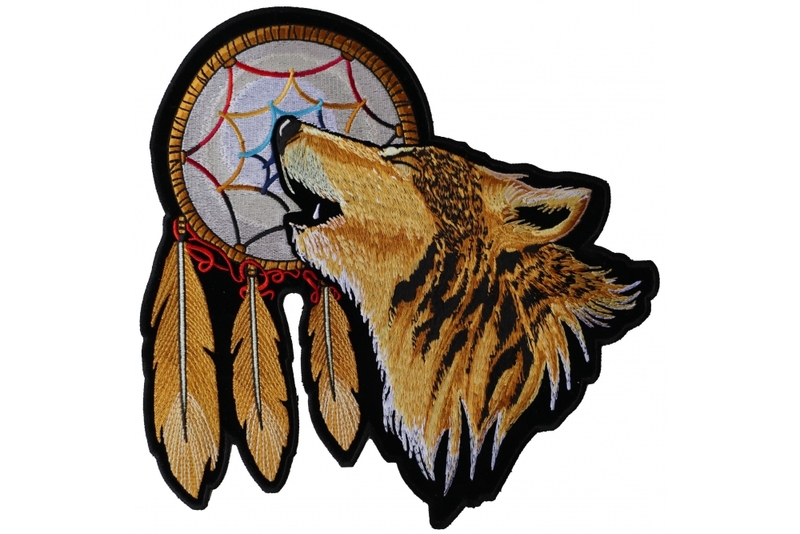 Howling wolf patch is a embroidered design of a brown/yellow wolf howling at the sky with a dreamcatcher in the background and feathers hanging below it. This large version of this Native American Patch measures 12x12 inches. The Wolf patch has been designed by Arturo Vilmenay. He received loyalties for his hard work. We thank you for buying genuine versions here at The Cheap Place. No reproduction is allowed without prior written permission. If you would like to purchase a whole bunch of this patch get in touch with us, we can provide the wolf patch at wholesale prices for you to resell.